Japan is set to move forward to developing a broadband and ubiquitous network society as envisioned under the concept of an advanced information society. And the successful implementation of e-government in Japan will serve as the foundation to achieving this goal. How does e-government affect the government itself, the business sector and the citizens? According to a 2005 user survey by the Institute of E-Government, the two main benefits of e-government are improved accessibility to information and transaction, and greater accountability from the government. To administer e-government in the country, the role of public sector and computerizations in various government agencies were taken into consideration. However, if computerization is limited to central government, this is of limited benefit to citizens. Thus, for communication between citizens and government, there is a need to go mainly through local government, not the central government directly. There is also a need to refer to e-municipality or e-local government, considering it of equal importance to e-government. It is also important to take into account issues against some aspects of an information society, but being overly anxious about them causes obstacles to promoting e-government. These issues include information security problems, lack of unified management of agencies and the risk of socio-economic digital divide. As such, one of the problems that every country has to face in promoting e-government is the legal system, embedded in every democratic government. 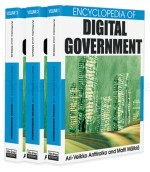 Computerization and informatization of the government is, in one respect, an effective administrative and fiscal reform, but requires legal mandates. Thus, reforms in the legal system, including regulation system, are inevitably called for.